It happens to everyone now and again: You need a wrench or socket, but you’re not sure exactly what size the bolt is. So you go back to your toolbox and grab a couple of different sizes. You get back to the fastener in question and find out you chose… poorly. Situations like this could be prevented with a tool like the Size Catcher from Wilmar. 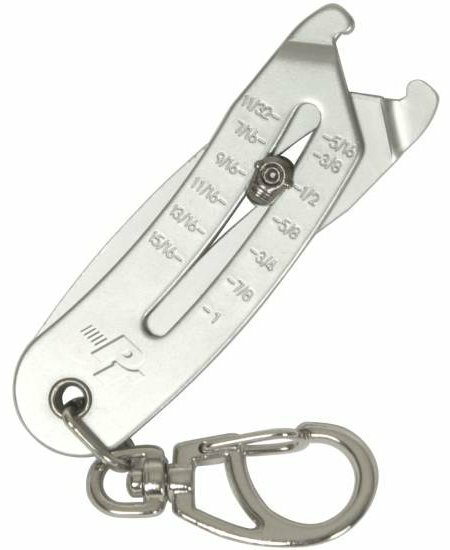 Small enough to fit on your key chain so you have it with you at all times, this gauge from their Performance Tool line can measure the size of the nut or bolt so you only need make a single trip. Wilmar brands the Size Catcher under their Performance Tool line. The dual-sided tool has fractional markings from 5/16″ to 1″ on one side and Metric markings from 8mm to 25mm on the other. Pricing starts at $5. Given that I ragged on the Star Bit Identifier in a previous post, I feel a bit conflicted about this product. Although the Size Catcher is nowhere near as bulky, doesn’t the same argument about adding an extra step in the identification process apply to this tool? I suppose the main difference is that you could actually carry this in your pocket. I think somebody really needs to build this into a multitool. I would love to see a scale like that incorporated into a Pocketwrench! The wrench-size measurement scale combined with the ability to turn a nut or bolt (light duty applications at least) would be a much easier sell. Back when I was a wee sprog, in grade 9, in auto shop class, one of the very first things we had to do was learn to correctly identify fastener sizes by eye. It’s actually not hard to do with a bit of practise, and makes life MUCH easier. if i find one i will buy it. i cannot state how often i have gone to find a bolt/nut and forgotten the size or the sample. saving just one trip will more than pay for that. besides, it looks cool. I think the argument for the star wrench sizers doesn’t apply here for a few reasons. First, this is small, singular, and compact, while the star wrench sizer is an array of large devices that are pretty bulky together. Second, this would probably see much wider application. If you’re using box or crescent wrenches, which honestly find FAR more use in my toolbox than star wrenches, you’re going to want to not have to bring nine wrenches and have none of them fit because the one size you didn’t think it was is the size it just happens to be. Third, this is probably lighter than the 3′ tape measure I have on my key ring, so toting it around isn’t uncomfortable. I could also see myself using this as a wrench in and of itself for really light torque applications. I have a bad luck with plastic tools. On top of that, I would wind up measuring more than just bolts with this. Got a piece of metal and I’m not sure how thick it is? Break this puppy out and find out! Not sure how wide the bolt thread is? Now I do! That star wrench set is too specialized. Like George, if I find one, I’m grabbing it. Same reasoning. I’d like to find one locally (not Sears – they want almost $18!) but, as was mentioned, this added to a Leatherman (my preference) would probably make me buy a new one. Maybe email the idea to them, even. Anyway, IF you always have this with you, it could be pretty useful. To the guys who want to find one locally, I found the Size Catcher at Menards on a side cap display between the plumbing and electrical sections. I don’t always mention when I see something at Menards, because it only effects a small subset of our audience. Ahh, good to see Travis is thinking about the realities of human nature. I’d eventually tire of using it and into the toolbox it would go, serving little or no purpose. Once I was with a trainee who decided he needed a switch but it was all the way back in the truck. I told him to save time he could use the one he had in his hand if he had a relay in his toolbox. Off to the truck he went, so I assumed he had no relay. Surprisingly he came back with a relay instead of the correct switch. He wasted the time and extra parts because it’s all billable … now that’s human nature! What a great idea. I have a hard time with fractional sizes and usually have to fetch several wrenches before I get it right. for $6 it’s a must have provided I don’t have to order it from some where and pay $10 shipping. other side of it is metric. I’m usually ok getting/guessing the right size if I know the nuts/bolts are SAE. When they’re metric, I usually have to get 3 wrenches/sockets – my guess, and one on each side of my guess to be sure. When I’m working on something that has a little bit of everything, I’m lost. Wheel over both metric and SAE toolboxes ’cause I’m guaranteed to guess wrong 80% of the time. Mac hit it on the head… For those of us working on later-model “American” vehicles, there can be a mix of SAE and metric fasteners. It’s a PITA to go grab the 9/16, 5/8, and 11/16″ wrenches, only to discover the damned fastener is actually 17 mm. I would happily carry this on my keychain – it might even replace my bottle opener. I feel like the jaws could easily be shaped better, probably more like an outside caliper in fact, to give it more capacity and make it easier to use. Hey BC, 11/16″ and 17mm are the same thing. Uh, actually 11/16 is 17.4625mm, but who’s counting?